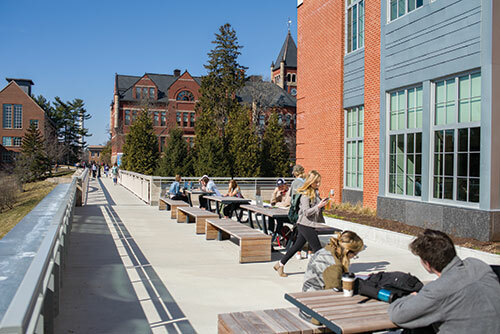 Ten years after establishing a program to help keep New Hampshire’s best and brightest in the state, long-time University of New Hampshire benefactor Dana Hamel has increased his support with an additional gift of $5 million. He is joined in providing support and scholarships for students by J. Morgan Rutman ‘84 and his wife Tara, in partnership with the Jane and Daniel Och Family Foundation, and Brian McCabe ‘91 and his wife Loren ‘90, ‘91G, who donated $3 million and $400,000 respectively. The Hamel family established the Hamel Scholars and Hamel Scholarships Program in 2007 to provide scholarships and support for students who have demonstrated academic excellence, leadership and community involvement. Over the last 10 years more than 180 students have benefitted from their generosity. In total, Hamel has donated more than $22 million to the initiative. “A gift to UNH and its students is an investment in the state of New Hampshire,” said Hamel. “UNH is the state’s greatest asset. By making it possible for our best and brightest students to stay in state for their education, my hope is that many of the Hamel Scholars will stay in the state after graduation and serve as mentors for the students who come after them and as leaders in every area of New Hampshire life, from culture and the environment to business and politics.” Many graduates of the program are now working in New Hampshire, helping to address the state’s skilled workforce needs. "We’re confident this gift will help reduce some of the barriers that women face and help equip them to become leaders in their fields. We are pleased to support the ongoing work of Paul College Dean Deborah Merrill-Sands to close the gender gap." Dana and his wife Karol reside in North Palm Beach, Fla., and Tuftonboro, N.H. He received an AB in economics from Harvard College in 1952 and an MBA from the Harvard Graduate School of Business Administration in 1954. He is currently a private investor. Previously, he co-founded Penn Corporation in 1964 and served as its chairman until it was sold in 1987. In addition to the Hamel Scholarships and Hamel Scholars Program, the Hamel family has also donated to help complete the Hamel Student Recreation Center and endow – along with other donors -- the Hamel Center for Undergraduate Research, which funds the university’s International Research Opportunities Program and Undergraduate Research Opportunities Program. Rutman is president of Willoughby Capital Holdings, a private investment company in New York. He graduated with honors from the UNH Whittemore School of Business and Economics and serves on the UNH Foundation board of directors as well as the University System of New Hampshire board of trustees. His father was a professor of history at UNH from 1968 to 1984. The majority of the Rutman and Och Family Foundation gift will provide scholarships and support to increase efforts by the Paul College of Business and Economics to attract more women of diverse backgrounds into business and economics education, and prepare both male and female students to appreciate the value of gender diversity in leadership and the important role that they can play as advocates and allies in advancing women’s leadership. The gift was funded in part by a grant from the New Hampshire Charitable Foundation’s Rutman Family Fund. To make a gift to endow a fund such as a scholarship or professorship or to support a program, or if you’re considering a bequest or have other estate planning questions, contact Troy Finn, associate vice president of development at (603) 862-4940 or troy.finn@unh.edu. In addition to encouraging gender equality in business, the Rutmans will enhance their support of the Shoals Marine Lab with additional scholarships in marine biology and expansion of the current artist in residence program to include all visual and written arts. The Rutmans will also fund an endowment to provide ongoing support for the Distinguished Lecture Series on the American Presidency, which was established in honor of his parents. McCabe, who serves as chair of the UNH Foundation board of directors, and his wife Loren established the McCabe Family Scholarship with their gift. It will provide need-based scholarships for undergraduate and graduate students studying education.